A night aspect of the Galerius Roman Palace at Navarino Square. Vibrant, youthful and polychromatic, this imposing neighborhood defines Thessaloniki's contemporary image. The “Whistling Boy,” the famous bronze statue by Nikolaos Pavlopoulos, is the hallmark of Navarino Square. Placed at the center of its small fountain, the statue, both because of its posture and “pastime,” is like a younger sibling to that renowned brass statue of the peeing boy in the Grand Platz in Brussels. Don’t bother to remember street names like Ippodromiou, Svolou, Gounari, Isavron, just ask for Navarino. This urban district comes laden with history, monuments and moods that evoke centuries past. It also conjures customs and behaviors that transport us, temporarily, to analogous, contemporary European cities. What am I saying, you might ask? 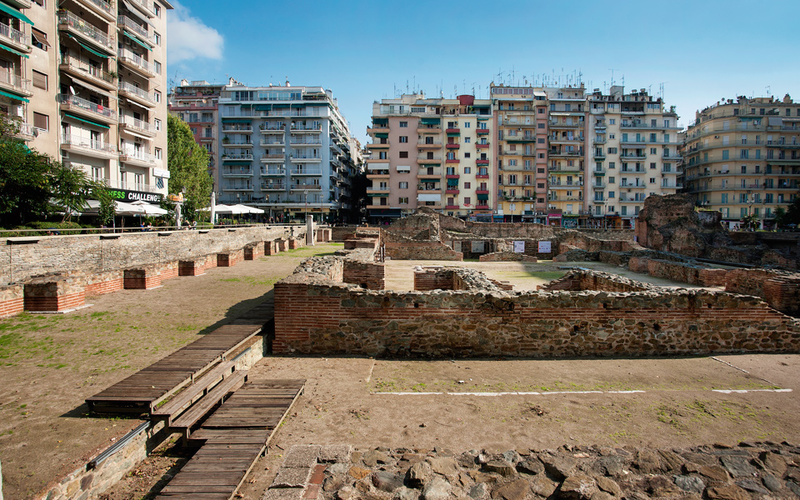 These restored Roman ruins of a palace that was built at the end of the 3rd century AD by Gaius Galerius Maximus bear witness to Thessaloniki’s cosmopolitan and multiracial DNA. Do not forget to admire them, for it is like gazing into the depths of a pool of water in which you will find reflected Rome’s Via Dei Fori Imperiali. But before I continue with my tour, a short lecture on Roman history is very much in order: Galerius’ marriage to Diocletian’s daughter, as well as the successful military campaigns that resulted in the defeat of the Persians, anointed him Caesar. 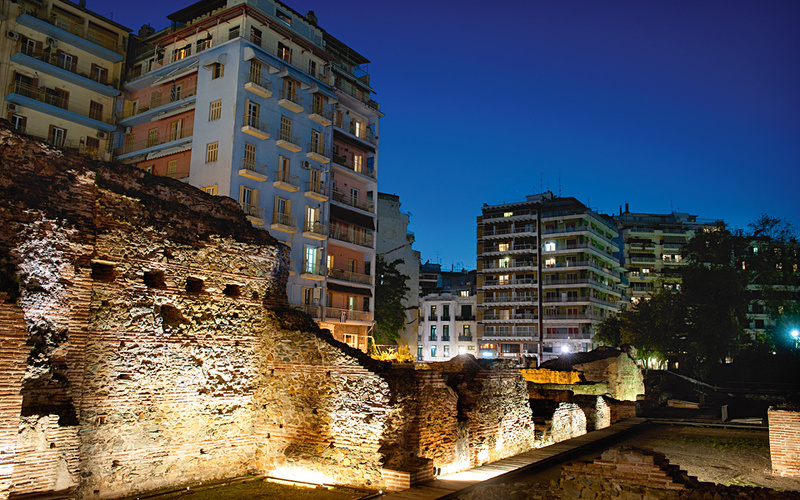 He in turn chose Thessaloniki as the administrative and religious center of his crown. This is the reason for the reigning image of the region today: its distinct echoes not only of Rome, but also of Paris. In fact, in no other neighborhood will you find as many creperies and hole-in-the wall bars and cafés. Apartment buildings from the 1960s and a 4th century Roman site, rub shoulders in an unwitting union of past and present. 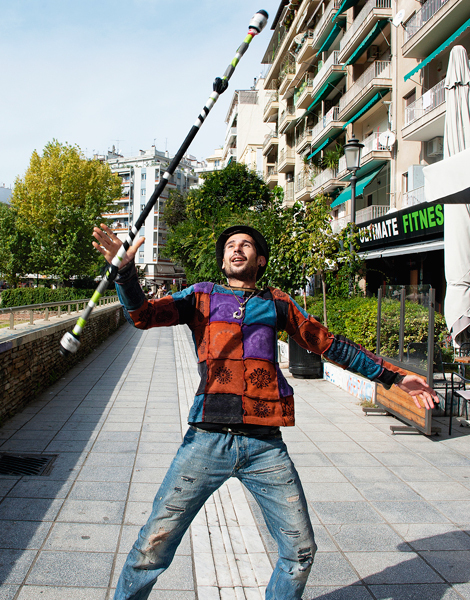 Expect the unexpected in Navarino Square. "The Whistling Boy" statue, the hallmark of Navarino Square. This is not at all surprising if you keep in mind that in the middle of the day, Navarino is overrun by thousands of students from the adjoining – just a stone’s throw away – campuses of Thessaloniki’s Aristotle University. They subsist on the staple diet of students the world over – sweet and savory crepes and gallons of caffeine and alcohol. It is in the square that young people spend most of their time: eating, drinking, flirting and bestowing on the area yet another identity: a hotbed of bohemianism and liberality as if, instead of the Thermaic Gulf, we were to find the Left Bank of the Seine just a few yards away. When the weather is good and the sun shines on the sea, and all is bathed in the light of spring or summer, it is imperative that you go outside and make a beeline to Navarino Square. On the stoops of dilapidated apartment buildings itinerant musicians strum chords from the Doors or Dylan, and there, suddenly, is that billowing of cosmopolitanism again: echoes of the San Francisco of Summer of Love or Camden Town in London are everywhere. Another resemblance – both ideological and stylistic – that Navarino bears with urban centers the world over are the dozens of little stores that ply alternative punk, goth and heavy-metal clothing, and are teeming with young boys and girls. They are unmoved by the siren-call of fashion’s multinational franchise brands and instead count on the “finer” dress codes of a bygone subculture’s moments of glory. 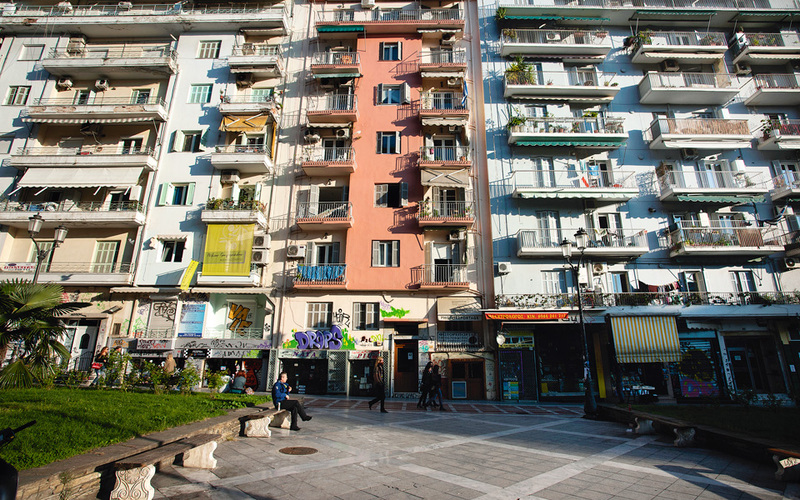 The colorful 1960s apartment blocks have become a quirky feature of the square. Welcome, then, to the most colorful, hippy crossroads of Thessaloniki, home to the free-wheeling, pluralistic tribes who inhabit it. And this little game of “spot the sister city” does not end here: let’s make our first stop Los Angeles, with its scores of tattoo parlors, edgy independent bookstores, Lilliputian computer and tech stores, comic book shops and hairdressers. You enter a mere mortal but are soon transformed into a Compton Ghetto boy or a girl extra in a Lana del Rey clip. These imbue Navarino with something of the essence of the West Coast. There it is, I have forewarned you, but still I need to remind you: this is where the shades of antiquity and contemporary codes of pop culture comingle, converse and concur; the ghosts of Roman centurions stand guard at night next to young punk rockers. Along the length of Dimitris Gounaris boulevard that connects Egnatia Way to the sea, interwar apartment blocks in the modernist architectural style bear witness to what is arguably the most interesting pedestrian zone in Thessaloniki and home to the city’s final remnants of a middle class. A bastion of tradition and ritual, they dine, for instance, in one of the many tavernas and restaurants where – and I say this off the record – some of the best grilled dishes found in Thessaloniki’s cuisine are served. When night falls, pull up a stool in one of the region’s many bars like a character in a Hopper painting. Take in the blaze of light from the marquees and shop windows and trace its reflection on the faces of passersby, or on the corners of street intersections. Now, finally, we are in New York City. Or perhaps we have returned to Baudelaire’s Paris, where the errant flaneur “reaches his spleen” – the culmination of the pleasure of perambulation – when, bewitched, he stands at the very epicenter of this urban phantasmagoria. Navarino is another country. • Stefanos Tsitsopoulos is the Editor of Soul Magazine and Thessaloniki correspondent of the Athens Voice weekly free-press.